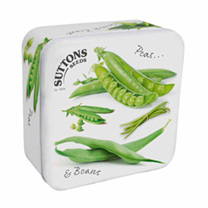 Keep your seeds safe, secure and dry in this colourful collectable seed tin. Size of tin: approximately 165 x 165 x 70mm. Contains 4 packs of pea and bean seeds worth over £11.00. The perfect gift idea for a gardener who loves growing from seeds.